Our study of East Asian folklore is coming to an official close soon. Monday and Tuesday will conclude with group presentations (and mostly likely blog posts about them), and the submission of the final podcast for your viewing pleasure. The podcast series, titled Gods, Ghosts, and Spirits of East Asia, should be available to the public within two weeks! As for Group 2’s individual podcast, after submitting two drafts and hearing feedback, we believe the podcast to be very thorough in its look into Buddhism in Chinese and Japanese folklore. Despite a few organizational concerns and production improvements to work out, the podcast is interesting even to us who have worked on it for over a week now. This tale is very similar to “The Dragon King’s Daughter” (in that it had no Buddhism influence for what we could tell and) since it is a love story of two very different individuals. Tou, the main character in the story, is said to be very poor, and the princess Lotus-flower is obviously of a wealthy, prestigious family. In a way Tou is victim to a Cinderella story that turns out to have all been a dream. However his moment of heroic, manliness did not end there, his dream was an analogy. The villagers in the royal family’s kingdom were bees and the giant serpent was a snake that had took over their hive. Tou made a new hive for them which goes on to prosper more and more every year thereafter. This tale is found in Chinese Ghost and Love Stories; one can say this sounds like a fairy tale similar to the ones we heard growing up. Despite realizing it was all a vision-like dream, the story ends on a happy note with the monster dead and a community thriving. 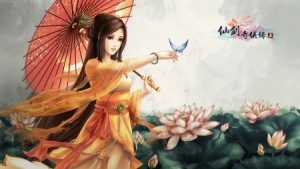 Although one could say the love story between Lotus-flower and Tou was a subplot to the real story of metaphoric significance, the fantastical elements of a princess and villain solidify one interpretation I reached. The fantastical elements are meant to captivate, but also remind the listener of the impossibility of a beautiful, rich women marrying a poor man. The story is meant to allow the listener to dream alongside Tou, but their aspirations shouldn’t change at the end of the story. At the end of the story, Tou’s life doesn’t really improve at all, if anything he provides shelter for the bees to ensure their survival. Based on the historical context of the Tang Dynasty, this relates to Tou’s assumed occupation of farmer since he is explicitly poor. Tou can only dream of love; his life is dedicated to his work. He gives the bees–which remember are the people in the dream–the means to thrive. In reality, that is as far as he can go. Well, that’s my last blog post. Thank you to those who have followed along, it has been fun. This is Adam Riekert, signing off. For most of China’s long history, foxes are among five animals with a significant role in human affairs. Fox spirits operate under an apparent dichotomy—many tales show them to be benevolent, while in others they are deceitful and quite evil—but their ability to shapeshift symbolizes their true place in rural Chinese society and its existing Confucian framework. After a brief introduction, I will go into great depth about fox spirits as they appear in folklore during the Imperial era. The scholarship on fox spirits categorizes them as both good and evil but favors the interpretation of them as usually more malevolent—evident when Rania Huntington, author of Alien Kind: Foxes and Late Imperial Chinese Narrative says, “Foxes could be both positive and, more usually, negative omens” (11). However, it is important to emphasis the dichotomy and the reason for such. Foxes are both demon and spirit. There are important reasons for why foxes are given two, somewhat opposite titles. Each title describes how it functions in Chinese culture. The tale from Pu Songling’s Strange Tales from a Chinese Studio, specially “The Alchemist,” although “The Boon-Companion” and “Miss Lianxing” as well, illustrates the virtuous aspect of the fox spirit. The main character of the story, Jia Zilong a scholar, befriends what he knows to be a man with knowledge of the immortals and magic, but what is later found to be a fox. The fox wanted to avoid making acquaintance with Jia based on his one bad quality of avarice, or extreme greed for wealth. This foreshadowing comes to greater fruition when Jia tries to steal the foxes’ black stone that can turn anything into silver or gold. Counter to what typically happens among fox tales, instead of death, immense suffering, or another severity, the termination of their friendship is the only punishment that Jia is dealt. A year later, Jia founds the black stone again to which, after encountering the fox, disobeys his wishes and falls into avarice again. However Jia reveals his plan to give the wealth away to the poor, and thus conquering his previous flaw. They continue to be friends. In Pu Songling’s collection of tales found in Strange Tales from a Chinese Studio, there are three tales with an instance to which a fox does harm to the human in the story. In “Friendship with Foxes,” the human falls from the perceived-to-be second story of a tavern after deceived by a fox, and must get those present to pay his way home. The “Marriage Lottery” ends with the main character marrying a hideous women who he thought, from the advice of a fox, was extremely beautiful. And there is a brief appearance of a fox in “The Magnanimous Girl,” wherein a fox is hunted and killed by the god-like heroine of the story. In all the above cases (besides the last), the humans displayed the characteristic of greed, lust, and vain, and therefore behaved negatively towards the disguised fox. Despite there being both good and bad instances of the fox spirit in Pu Songling’s collection, with the addition of “The Fight with the Foxes” and “The Marriage of the Fox’s Daughter,” fox spirits seem to treat the human characters of Chinese folklore in the same manner to which they treat the fox. One might even say it operates similar to the Golden Rule—an idea also linked to the Confucian ideology of the time; “do not impose on others what you do not wish for yourself” (Freedman, 1). Confucianism, half-religion and half-philosophy (also called an ethic or political ideology), was created as a strict outline for the everyday life of Chinese people. Shortly, I will discuss how this framework was also used to provide stability. Confucianism brings us to another function of the fox, though closely related to treating others with respect and kindness, is more specific in terms. Filial piety outlines important relationships in Chinese society and how the members in each relationship should interact. Typically filial piety is viewed as a son respecting and obeying his father—an ethics for the living—but this patriarchy extends to the dead. Ancestor worship is an important part of filial piety: the dead rely on the living for help in the afterlife, such as with obtaining food, money, and pardon from bad deeds. The fox achieves the function of somewhat enforcing ancestor worship, or at least reminding the listener of its importance. This originated because foxes frequently inhabited caves where ancestors were buried. Foxes are therefore known as spirits due to their proximity to ancestors and the fascination they inspire in people. This is evident in Edward T.C. Werner’s monograph Myths and Legends of China, where he says, “they are supposed to be the transmigrated souls of deceased human beings” (1). This is confirmed by Qitao Guo, in a review on Xiaofei’s previously-mentioned monograph, when Guo says this about the fox, “they intruded into the domestic arena…strengthening ancestral authority [etc. ]” (195). Therefore, the worship of foxes due to their close connection to the dead, as either the spirit of ancestors or a medium for them (“coursers upon which ghostly being ride”), fulfills and integrates the Confucian value of ancestor worship with the natural world (Johnson, 38). Fox spirits were the bridge for Confucianism, a largely political ideology, to integrate the ideal of subservience to those superior with the individual households of rural China, who valued ancestor worship, a sense of community, and a respect for the distant and sublime. Furthermore, the idea of demons used to police people’s behavior, especially in a poor, rural area as imperial North China, is not a new concept. Xiaofei Kang, author of The Cult of the Fox: Power, Gender, and Popular Religion in Late Imperial and Modern China, adds, “As deities of demonic origins, they are worshipped on some occasions and exorcised on others” (3). Fox spirit worship has existed in China for centuries. Although the worship is very personal to each household, the practice is connected to a fox cult—defined as “any kind of human interaction with fox spirits, [including] worship as well as exorcism, devotion as well as fear, disgust, and suspicion” (Kang, 11). For many people, fox spirits symbolize many characteristics that merge into one complex identity. They are quasi-intelligent, yokai-like creatures that live on the verges of civilization while also inhabiting sacred places such as tombs (as I said earlier). Therefore, surrounding the fox cult, is the belief that the teachings of foxes are to be adhered to out of both fear and reverence. Foxes, both good and bad, serve to reiterate the before-mentioned Confucianism as it is orally passed on from one generation to another, and as an integral part of the identity of the community. In addition, fox spirits, again, were used to influence the behavior of those who heard fox tales. But who was trying to police whose behavior? And in what way exactly were they doing this besides through the Confucian ideology? Secondary sources on fox tales display the wide range of meaning behind the use of fox spirits. Xiaofei Kang, in “The Fox [hu] and the Barbarian [hu]: Unraveling Representations of the Other in Late Tang Tales,” conveys that fox spirits found in folklore and legends were viewed by the educated class as a backlash against foreign elements to China during the time, and a desire to return to Confucianism and its old Chinese identity. However in The Cult the Fox (already mentioned before), she says, “The complex and often contradictory representations of foxes in early periods have had a long-lasting impact on Chinese history” (14). There are examples of foxes used to both support and undermine political authority (Kang, 15-16). In addition, foxes are possessive, metamorphic, and sexual enchanting, but also a model of humaneness and eternal peace (Kang, 15-16). Foxes were a common part of almost every household—there’s the saying “where there is no fox demon, no village can be established” (Huntington, 14)—yet foxes were said to be an advocate for marginalized groups (Kang, 7-8). Therefore, because foxes can be found supporting or denouncing a wide range of groups, ideas, and characteristics, I conclude that the fox’s role in Chinese culture was virtually ever-changing as much as the foxes were in the various tales themselves. The fox’s shapeshifting characteristic is symbolic to its role in Chinese lore. Many groups of varying class and status use the fox differently to fulfill obviously different agendas; the main two being as demons or benevolent spirits. Mainly, demons act as proponents for Confucianism or manifestations of foreign elements to inspire Chinese cultural pride; the spirits connect to ancestral worship and how people view the sublime—in that they attached it to a strange, reclusive animal, living on the fringes of their space in time. Huntington, Rania. Alien Kind: Foxes and Late Imperial Chinese Narrative (Harvard East Asian Monographs). Harvard University Asia Center: 1 March 2004. Print. Johnson, T.W. “Far Eastern Fox Lore.” Asian Folklore Studies, 1994, ed. 33, no. 1, pp. 35-68, DOI: 10.2307/1177503. Nanzan University. Kang, Xiaofei. “The Fox [hu] and the Barbarian [hu]: Unraveling Representations of the Other in Late Tang Tales” (1999). Journal of Chinese Religions, 13 July 2013, pp. 35-67, ed. 21, no. 1, DOI: 10.1179/073776999805306777. Pu, Sung-ling. Chinese Ghost & Love Stories. Tuttle Publishing, 1946. Xiaofei, Kang. The Cult of the Fox: Power, Gender, and Popular Religion in Late Imperial and Modern China. Columbia University Press: New York, 1 January 2006. Print. So today I am going to be writing on a figure that is incredibly prevalent throughout Chinese mythology, but is also big in modern culture as well. Sun Wukong is one of the four spiritual primates that basically are the only beings not categorized in the universe. He is the monkey of stone and is said to be born out of a magic stone. Being pure stone he is incredibly durable and is capable of fantastic feats of strength. If that was not enough he also acquired legendary items throughout his journey such as cloud walking boots and a golden chain mail shirt. His most well-known item is a staff that he has that supposedly weighs around 8 tons. However, that is not the craziest thing about it, as he usually has it shrunk down so that he can carry it behind his ear. Using these items, his natural strength, and other fantastic abilities, he causes chaos throughout the heavenly kingdom. He is not evil, but rather a trickster who enjoys chaos. After causing chaos, and essentially cheating death, the Jade Emperor, who is the emperor of the gods to put it simply, invites him to heaven so he can give him a post in order to better control him. 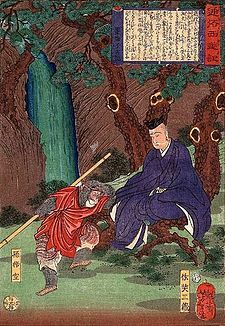 Wukong is given the post of stable master, and for a time this keeps him satisfied. However, he eventually realizes it is the lowest post in the Kingdom Of Heaven, causing him to release the horses and cause chaos once again. He then fights and defeats all the celestial figures in Chinese mythology, and is eventually defeated and imprisoned by the Buddha. We saw one version of how he is released with Journey To The West, though again he is not as evil as the film made him out to be. The headband that we see him wearing at the end is also important, as it allows Xuanzang to control him on their journey to obtain the sutras. Throughout the journey, he learns what it is like to do good, and at the end of it is granted Buddhahood. That is the end of the main story about him, which is Journey To The West, but there are many more stories about his other adventures. In modern culture, there are various representations of him in video games and movies. We already saw one of the more modern versions of him in the film we watched, but there are many more. There are also representations of him in plays and other forms of theater. Even video games are starting to have representations of him, especially internet ones. Overall I think the actual story behind him is really cool, and I’m glad I got to read about him. Taking into account how the legend has grown, and how he is represented has changed over time is also just incredibly interesting. We got a lot of great recording done today and are getting ready to finish up our early draft of the podcast. Although we are still getting used to recording ourselves and how this project differs from a standard presentation, we are starting to gain some momentum and cover all of the material we wanted to look at, I’m looking forward to tomorrow and having an equally productive day! In this post I’m going to bring up two pop culture pertinent to our podcast, as a way to see the modern opinion and social importance of snakes and dragons. To do this, I am looking at the Dragon Shen-long from Dragon Ball Z (a childhood favorite of mine), and Nagini from Harry Potter (a general favorite for many). Shen-long appears in the Manga for Dragon Ball Z, and is significant in my mind for two reasons. The first is because he is an impossibly powerful being in that he can grant wishes, and is the purpose for the whole general plot. The second is because he is actually a Chinese dragon that appears in Japanese media. This idea isn’t too far fetched as cultural exchange between the two countries often occurs (especially when dragons are involved) and is almost reminiscent of times when dragon lore was being brought in from china hundreds of years ago. Moving to the TV show, the dragons name was changed to Shenron, and although the original Chinese Shen-long was an immensely powerful water god, common theme for dragons, the Shen long/Shenron in pop culture is seen more on the side of just being immensely powerful. This fits with the more ancient narrative of powerful dragon gods. Nagini is a particularly special use of a snake in pop culture, and is perfect for this discussion. This is because of her name. If you refer back to an older post that I’ve made, I discuss the Indian dragon kings which are known as Naga. Heavily resembling cobras, the Naga are then co-opted into Chinese and Japanese lore. As you may have been able to guess, Nagini is not only based on the term Naga, it is the feminine form of the word. This is important because of the east Asian association between snakes and women, and often times have a malevolent intent. In this way Nagini is a perfect representation of east Asian lore in Modern pop culture. These are just two examples, however their are many more, particularly in Anime. Modern pop culture has seen a rise in old myths, and has shown that the respectful and inventive use of old mythology can be executed quite well. Group Mononoke is hard at work putting the pieces together as to how Studio Ghibli’s film Princess Mononoke relates to Asian history and mythology, and in the process of analyzing entries about youkai and the like, it became apparent that a particularly crucial figure in the film drew considerably from certain legendary creature. Princess Mononoke‘s central deity in its mythos is the placid yet ominous Forest Spirit, a shapeshifting elk-like being which holds dominion over nature and therefore serves as opposition to all in the film who conspire against nature. As it has multiple forms, it is somewhat an amalgam of different mythological ideas from Asia, with a healthy portion of Studio Ghibli’s originality added in to keep with the stylistic senses of the rest of the film. But even so, the Forest Spirit’s underlying manor bears a striking similarity to an Asian mythological creature of similar status: the Kirin. 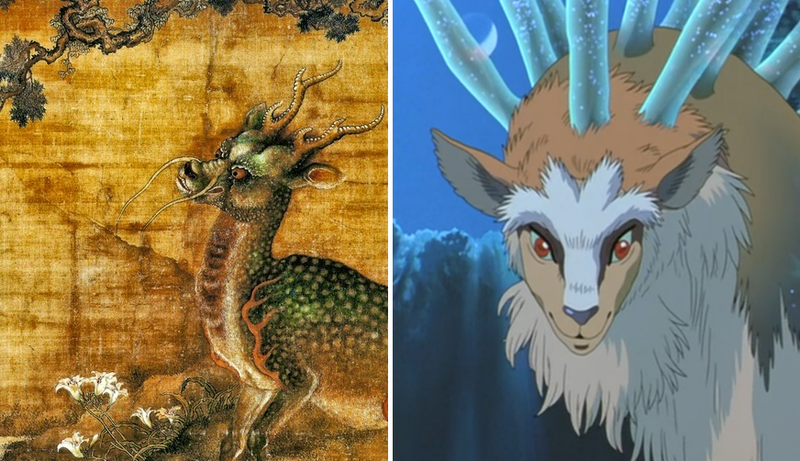 The Spirit’s likeness to the Kirin isn’t exactly one-to-one, and looking at both creatures might prompt someone to ask if they have any real similarities whatsoever, but what similarities do exist between them are very important to the film, and hearken to myths in a way that requires further study to comprehend. As such, it seems appropriate to give greater attention to this creature and its place in Asian myth, in order to better understand how its inspiration manifests in the film proper. The Kirin (or Qilin if you want it romanized in Pinyin) is a creature that was first referenced in the old Chinese narrative, the Zuo Zhuan, which was a well-regarded commentary on parts of the Zhou dynasty of ancient China. In it, the creature’s arrival is said to have marked the impending birth and death of Confucius, an event that thenceforth closely associated the Kirin with the concepts of mortality and – following the widespread adoption of Confucianism throughout China in later centuries – good omens. Its connection to life and death eventually earned it the status of a being connected to the gods, or even a divine being itself. It gained a reputation as a beast of purity and justice, able to peer into people’s hearts and judge their moral character, and only punishing the wicked while never harming the innocent. Later Buddhist influence on the creature’s lore went so far as to describe it as never partaking in another creature’s flesh or stepping on greenery for fear harming the plants, and gave it the ability to walk on water or air instead. Today it remains as powerful symbol of morality and respect for nature, which is clearly evident in the Forest Spirit’s role as protector of nature and the veritable linchpin of life or death in the film. As would be expected for a creature that’s existed in human consciousness for over 2000 years, the Kirin’s appearance has seen some changes over time due to inevitable shifts in aesthetic, influence of the appearances of real animals, and intermingling of myths from other cultures. However, there are some features that have remained fairly consistent. The Kirin is almost always depicted as a hooved and horned animal with a body shape similar to that of an ox, horse, or deer. Traditionally it borrows much from the appearance of Chinese dragons by having scales, a fearsome leonine visage with tapering whiskers, and sometimes the ability to manipulate fire. This interpretation persists today, but permutations of it became popular once the Kirin’s name was adapted as a term for a particular real-life animal that was foreign to historic Asia: the giraffe. According to legend, giraffes were to referred to as Kirins once they were brought to Asia from Africa, on the grounds that they were magical creatures not unlike the Kirin itself. As such, their appearance gradually seeped into interpretations of the Kirin as a more mammalian animal, akin to a reptilian steed rather than a draconic beast. This trend was reinforced by the influence of European myths about creatures like the unicorn, which spread to Asia centuries later. The Kirin thusly underwent a “westernization” of sorts to the point where it is now often referred to as “the Chinese unicorn”; it’s quite common to see the creature depicted as an equine or cervine being with a single horn instead of multiple ones. Again, depictions vary, but it goes to show that Kirin is certainly capable of inspiring a creature that may not resemble it clearly, and in time that inspired creature may even become part of the Kirin’s lore. Furthermore, the idea to take away from this is that the Kirin’s inspiration for the Forest Spirit in Princess Mononoke is less physical and more practical. The Forest Spirit mirrors the Kirin’s legacy accurately by being a divine being which concerns itself intrinsically with the birth and loss of life. Its every footstep grows and then kills plants in its wake, which may be a reference to the Kirin’s aforementioned aversion to stepping on plants for fear of unjustly harming or killing them, and it can also walk on water. It is trusted to be able to judge the purity and content of others’ hearts, just as the Kirin can, and just as it protects life, it takes away life only in situations where innocence is in danger just like the Kirin is said to do. Summarily, while the Forest Spirit is not quite as explicit in its judgement of others’ moral righteousness, its wrath which is incurred on the entire cast by those who wish to harm nature can be seen as a form of punishment not unlike how the Kirin is reputed to punish the wicked. Only an act of bravery and kindness is able to sate its destructive rampage, and once it’s been appeased, it immediately sets things right as a symbol of justice would. In conclusion, Princess Mononoke‘s forest spirit can be interpreted as another modernized incarnation of the Kirin with some other elements mixed in. This is far from the only instance of correlation between the film and real-life context (historical or mythological), but given the Kirin’s long-standing legacy and the Forest Spirit’s integral part in the movie, it looks like a particularly latent yet profound reference is made. Alexander, Skye. Unicorns: The Myths, Legends, & Lore. Adams Media Corporation, 2015. Chan, Joan. East Meets West. Author House, 2009. Zuo, Qiuming. The Chronicle of Zuo (Chunqiu Zuo Zhuan). JiaHu Books, 2013. I recently picked up a book in the library, titled Ennin’s Travels in T’ang China. This book combines a primary source, Ennin’s Diary, with the thoughts of the author, Edwin O. Reischauer who is a professor of far eastern languages at Harvard University. Not only does Reischauer add vital information, but the often summarized writings of Ennin contribute more detailed information than the typical monograph. Ennin, known as Jikaku Daishi in Japan (sounds familiar as it might been from Japanese Tales), was a Buddhist monk. He traveled from Japan in 838 A.D. in order to later introduce to the world a place absolutely foreign to outsiders–after all, his diary is the first account of life in China by any foreign visitor. Similar to Ennin, Reischauer, after translating Ennin’s massive work and attaching footnotes, is also one of the first to bring this work to a new (Western) audience. As long-winded as that might have been. I can understand firsthand even just a small part of that. In the fall of 2015, I studied and traveled for roughly four-and-a-half months in China. I climbed Huangshan (Yellow Mtn. ), explored Guilin, celebrated an international ice and snow festival in Harbin, lived in Shanghai, and toured Beijing and Hangzhou. Although my travel didn’t have an importance to the degree of Ennin’s (obviously), it was vital to my understanding of both the world as a whole, and the world as it is lived in modern China. Even though deadlines are fast approaching, I will spend as much time as possible combing through Ennin’s collection–ranging from Chinese officials, popular festivals, and the persecution of Buddhism. This should be a significant source for my portion of the podcast, at least. Group 5 Finally decided that although “5” was a good name and treated us well, it was time to choose a new name that was a bit more personal and connected to our final project. With this in mind, we agreed on the name “Nāga”. The Nāga were mentioned in Caitlin’s update, but upon more reading, we found that the integration and influence from the Indian/Buddhist Nāga into Chinese, and particularly Japanese myth, is quite prominent. This further reading comes primarily from the book The Dragon in China and Japan, written by M. W. de Visser. This book is an example of stumbling upon a near perfect source for this part of our research, a phenomena that is quite satisfying to any researcher. Although the Buddhist Nāga of India are not intended to be the main focus of our final project, they are still crucial to analysis due to how their myth has integrated into local lore, and from the historical context the myths give to the transfer and shaping of ideas. 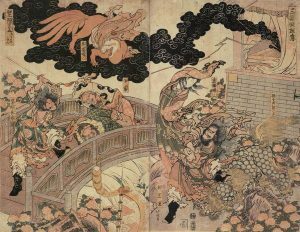 The integration of myth and lore can be seen more heavily in Japan than China because Buddhist influence was stronger in Japan, however, both nations incorporated these Buddhist creatures. This may not have been a radical change though, because the Nāga and the local dragons and serpents shared many of the same qualities, mostly pertaining to water and strength. The influence from Buddhist myth in japan can then be seen clearly by de Visser’s attention to their reverence of the Buddha and his teachings, showing that the Buddha can be even more powerful than dragon gods. Seen below is an image of the Buddha riding a Japanese dragon, showing the relationship of the Buddha with the dragons who are known to “supplicate” before him as de Visser states. Research into the historical context of Chinese and Japanese dragons is making me even more excited to flesh out the rest of the project, and to analyze what dragons and snakes may indicate about China and Japan through their stories. We are beginning to plan and outline our script for the podcast. This is still a work in progress but we are confident that we will be able to get some audio recorded this week. A lot of progress was made today and the project is coming along nicely. Natsuhiko, Kyogoku. “北斎妖怪百景.” Hokusai Yōkai Hyakkei (Book, 2004) [WorldCat.org]. May 09, 2016. Accessed January 09, 2017. http://www.worldcat.org/title/hokusai-yokai-hyakkei/oclc/57492306. Death welcomes you to a new week! Our group hopes you had an enjoyable weekend. In our last post, we covered topic proposals for the podcast episode. After conducting more research over the past few days, death has finally claimed its second victim (see day 2 post for our first). After much deliberation, we have decided to drop fox spirits and focus on the Qixi/Tanabata festival. Although there could have been unique discussions about the symbolism of fox spirits, we found some possible hardships. 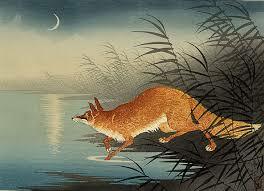 Mainly, there is an abundance of stories meaning a variety of fox spirits with different meanings. There are some that serve the gods, mostly focus on causing mischief for people, and etc. As a result, this could jeopardize the organization of our podcast. Causing us to go in many different directions instead of having a full and deep analysis. However, we are excited to begin more research on Qixi and Tanabata! First, we are interested to see the development of the story in both China and Japan. The tale is also popular in Korea, but the holiday is not largely celebrated and our group would like to keep this discussion as concise as possible. Have we claimed a third victim? At any rate, we are largely interested in looking at the time periods surrounding these stories. For China, we will mainly be researching society during the Han dynasty. There will be two periods for Japan: Heian and Edo. The former is when the holiday was introduced to Japanese society and the latter when the whole population was able to celebrate. Beforehand, Tanabata was only celebrated by the elite. An interesting society development we could analyze. In addition, Group Death is considering looking into marriage structures during these time periods because the focus of the story is marriage and how the lovers were separated. This will especially be an interesting topic for our China research because Lawrence informed us that three versions of the Qixi story were created over time. This development could mean changing societal norms. More details will be coming tomorrow! Good luck to group member Eve as she will be presenting tomorrow. Thank you for your continued support! First week is finally finished and Group death has survived this week!!! Today is an important day. We had our presentation and narrowing down our topic for the podcast. Currently we have two topics proposal. One is “Fox Spirits” in China and Japan the other is a festival celebrate across the East Asia called Qixi (Chinese) or Tanabata (Japanese). • Hu Jia Hu Wei (a Fox Fake, Under Tiger’s Power): An allegory for tricksters and scoundrels that bend others to their will by flaunting their powerful connections. For the second proposal, we are going to focus on the story of Qixi (Tanabata). A story about two lovers (a star weaver and cow herder) who marry and are later separated by the milky way. The two are only able to see each other once a year. However, this tale not only has different version across the region, but also as time passes changed serval times in China. This variation intrigued our group. We intend to elaborate on how the alterations in historical context and social norms in different era and region might give rise to the changes in this story.